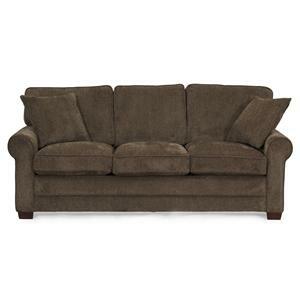 This queen sleeper sofa is a covered in a super soft chenille fabric that is built to last. Arms are removable so this sleeper can be delivered anywhere. The mattress is constructed with visco elastic foam for great support with a gel topper to keep you cool. 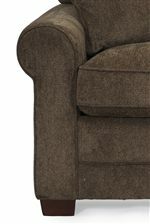 No more metal springs in your back, this is most definitely not your parents old sleeper sofa. Simple rolled arms , block feet and loose cushions create a casual style to fit in any home! The 1021 Casual Queen Sleeper with Rolled Arms and Loose Pillow Back by Synergy Home Furnishings is available in the area from BigFurnitureWebsite. 1021-96 Rolled Arm 2 Pack 1 8" 38" 23"
1021-11 Queen Armless Sleeper 1 69" 39" 37"